Two Chicks On Books: Blog Tour- SWORD AND VERSE by Kathy MacMillan An Interview and a Giveaway! 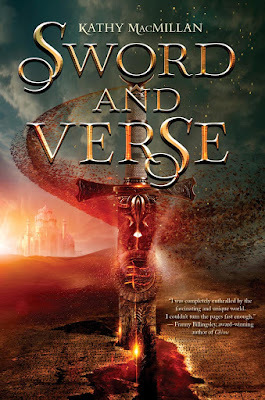 Blog Tour- SWORD AND VERSE by Kathy MacMillan An Interview and a Giveaway! 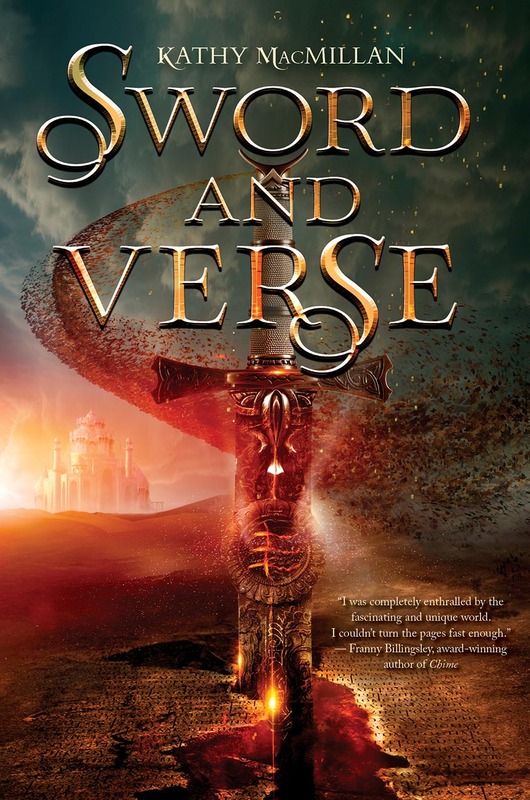 I am so excited to be kicking off the blog tour for SWORD AND VERSE by Kathy Macmillan. This book was absolutely beautifully written and was totally swoon worthy and I can't wait for you all to read it! I have an interview with Kathy to share with you today! And make sure to enter the giveaway! Haven't heard of SWORD AND VERSE? Check it out! Hi Kathy! First I want to say welcome to Two Chicks on Books! I loved SWORD AND VERSE and I know my readers will as well and am so happy that you could stop by for a visit! For the readers: can you tell us a little bit about SWORD AND VERSE and the characters? The story centers around Raisa, a slave girl who is chosen for the most exalted position a slave can hold in the land of Qilara: Prince’s Tutor. She learns to write the sacred language of the gods, studying alongside Prince Mati, whose future children she is being trained to teach. Romance blossoms, but neither Raisa nor Mati has the luxury of forgetting their different stations, and when the Resistance courts Raisa to help free her people, she has some very tough choices to make. Was this always going to be a standalone or had you thought of making it a series? I had always intended this to be a standalone, right up until about a year ago when one of the other characters started demanding her own story. SWORD AND VERSE does stand alone – no cliffhanger ending, promise! It ends at a place full of promise and hope, but of course the challenges aren’t over for Raisa and her friends. I am working on a sequel that picks up the story from Soraya’s point of view, and the story deals with the repercussions of choices made in SWORD AND VERSE. Where did the writing come from in SWORD AND VERSE? Was it like Egyptian hieroglyphs or Asian influenced characters or did you take a few writing styles and combine them? There are three different scripts that play a role in SWORD AND VERSE. Two of them are hieroglyphic (picture-based) and one is syllabic – not quite like the alphabet most of us are used to, but similarly sound-based. I am a huge linguistics nerd so the inspiration for these came from many different cultures. I took ideas from multiple languages and put them together in ways that made sense for the cultures I was depicting – one that held knowledge in a tight fist and one that encouraged learning by anyone. There are bits and pieces of people I know in all of my characters, but only two I can specifically identify as being inspired by real people. Raisa was very much inspired by my mother. My mom is one of those people who may seem meek and quiet and agreeable on the surface, but has a will of iron underneath. I knew I wanted to explore that kind of strength in Raisa. We see so many female characters in YA who exhibit physical strength, and that’s great, but there is more than one way to be strong. The other character is a minor one, but she means a lot to me. It’s Anet, the woman Raisa meets in the tombs. She is based on my friend Annette, who passed away a few years ago (and to whom the book is dedicated). Annette was an early reader of the book, and I tried to work that character in over multiple drafts in tribute to her. It wasn’t until the final draft that that scene came together, and anyone who knew Annette will recognize her in the description of Anet’s laugh! My favorite character is whichever one I am currently writing! I tend to internalize the qualities of a character when I am doing a lot of work in his or her point of view. Raisa has a very hopeful, sunny quality to her, so it was probably good that I was in her mindset for so long during submissions and edits. Right now I have a real affinity with Soraya, but since she can be rather grouchy and suspicious, this is probably worse for those around me. What is your favorite passage/scene in SWORD AND VERSE? There are two, but both are kind of spoiler-y so I will be vague. The first is the scene between Raisa and Mati after the Selection, when he comes to ask why she lied, because that is just swoony. The other is also between Raisa and Mati, and it is the sequence after her punishment, when they are finally being honest with each other. That was very difficult to write, because it had to have the right balance between suspicion, hurt, and love. I did a lot of research on ancient cultures and the history of various writing systems. The cultures and countries in the story are entirely made up, but ancient Alexandria provided a lot of the feel. I just finished reading DON’T GET CAUGHT by Kurt Dinan, which is a hilarious book that totally lives up to the tagline “Ocean’s Eleven meets The Breakfast Club”. And I am a few chapters into THE DISTANCE FROM A TO Z by Natalie Blitt, which I am really enjoying. It’s a contemporary, but I think the protagonist, Abby, would get along great with Raisa! Sean Kendrick from THE SCORPIO RACES by Maggie Stiefvater. I have always been interested in telling stories about characters figuring out who they are and how they relate to other people while holding on to their own sense of self. And that’s pretty much the main concern of YA, so it’s a good fit! It’s already out, but since I have been drowning in revisions I haven’t seen it yet: BROOKLYN starring Saoirse Ronan. Thanks so much Kathy for answering my questions! Kathy MacMillan is a writer, American Sign Language interpreter, consultant, librarian, signing storyteller, and avowed Hufflepuff. Her debut young adult novel, Sword and Verse, explores questions of power and prejudice in an epic fantasy setting, and has been called “fascinating and unique” by National Book Award finalist Franny Billingsley. 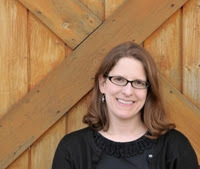 Kathy is the founder of The Sweet Sixteens (www.thesweet16s.com) debut group of 2016 middle grade and young adult authors, and serves as the Published and Listed Member Coordinator for the Maryland/Delaware/West Virginia Region of the Society for Children’s Book Writers and Illustrators. She is also the author of eight resource books for educators, librarians, and parents, including Little Hands and Big Hands: Children and Adults Signing Together (Huron Street Press, 2013). She lives near Baltimore, MD with her husband, son, and a cat named Pancake. Find her online at www.kathymacmillan.com or on Twitter at @kathys_quill. 5 Winners will receive a finished copy of SWORD AND VERSE. US Only. Okay this book sounds magical. An Kathy MacMillian might be my new favorite author if this book is really how it sounds and all the reviews are right if can't wait. This looks like it's going to be a very well written book. I can't wait to read it myself! I love the reviews that this book is getting--makes me want to read it and soon! This sounds like such a wonderful read!!! This sounds really good! I love YA fantasies! I love that this story incorporates inspiration from Alexandria and other languages. I'm also loving that it's a stand alone. I do love a good stand alone. This sounds really good and I love that the authors favorite show is Fraggle Rock!! I'd love to read this book. Thanks for the intro and the giveaway! Yes! This book has been on my Goodreads TBR since Epic Reads revealed the cover oh-so-long ago! I needs all the fantasy and this book promises to be a good one! I have a US address but rafflecopter might show my location outside the US because I'm doing a semester abroad.